Just over a year ago – I was asked if I’d be willing to take on a landscape commission… as most of you know – I specialize in portrait tapestry weaving….so you can understand that landscape is a little different for me…. The client had a photograph that her husband took and cherished that she wanted to have as the inspiration for a tapestry… I decided to create a new design so the tapestry wasn’t just a copy of the photograph but became a little more layered – I added the longitude and latitude of where the photograph was taken and also added a secret ingredient of the constellations of the members of their family – secret because it can only be seen at night! As the tapestry was a gift and the recipient didn’t know about it until it was finished and posted to him – I wasn’t able to post pictures until now…. Here is an image of the glow in the dark thread – whilst the tapestry was still being woven – you can see the bobbins with the glow in the dark thread hanging! This entry was posted in Blog and tagged hanwoven, landscape appletons, romantic, tapestry, woven on 26/10/2016 by Emma Webster. The last 18 months have been amazing – I loved weaving up at Stirling Castle on the Hunt of the Unicorn (which was finished in December – will be on display in late spring). I do miss being there and the comradery with the staff at the castle. I don’t, I admit miss the drive there and back every day! 2 weeks ago I started a new part time job at The Dovecot Studios Edinburgh, I am delighted to be part of an amazing weaving team and have been welcomed very warmly! Part time suits me very well as I am able to carry on with family life and commission commitments that I have. The pallette of colours that I’m weaving with at the moment couldn’t be further from the medieval pallette that I’ve been used to the last 18 months. The piece I’m working on just now as part of a team is by Victoria Crowe. It is a huge piece being woven in many panels and the colours are glorious! This entry was posted in Blog and tagged tapestry, tapestry studio on 15/02/2015 by Emma Webster. I often run classes from my studio in Dennistoun – Please watch this space to find out future dates – thank you. My classes that I run are very small only 3 people maximum per class – so you do almost get one to one tutoring! This does also mean that they can fill up very quickly indeed. I also occasionally run a wee ‘weavers knot’ – where weavers can bring along the project they are weaving on and weave! I often do them when I’m weaving a project or commission – so I’m weaving too! Great fun and lots of textile chat goes on! A small fee is asked for to cover teas and coffees. If you think you might be interested in taking part in a ‘weavers knot’ please do contact me! I am also willing to do one to one tutorials and I am fairly flexible with dates and will add extra dates if people wish. 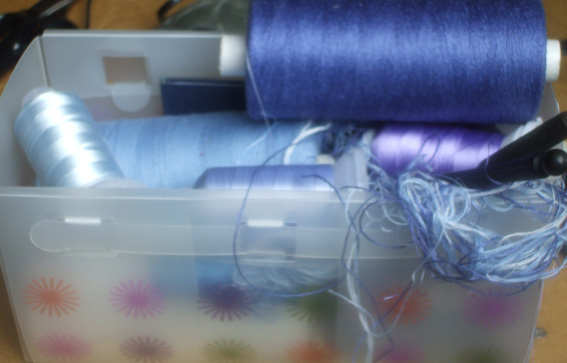 My classes are small as I hold them in my studio which is where I keep a large stock of yarn, I also think that if the classes are small they are more personable to each students needs. 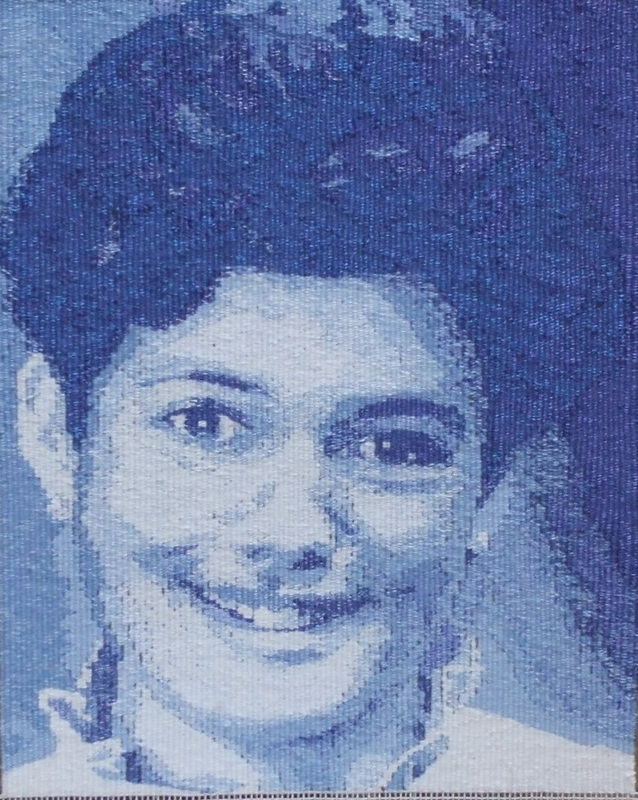 This entry was posted in Classes and tagged beginners tapestry, handweaving for beginners, tapestry, tapestry portrait, tapestry weaving classes, weavers knot on 14/03/2013 by WebPerson. this is the start of new work, inspired from my other love …colour! each strand is made up from many tiny handwoven pieces and represents a plant from my wee garden , ie daisy, the rose at my front door ‘brave heart’ ,pink cowslip and some others , for me its quite a large piece made up from lots of tiny pieces each about the size of a stamp. 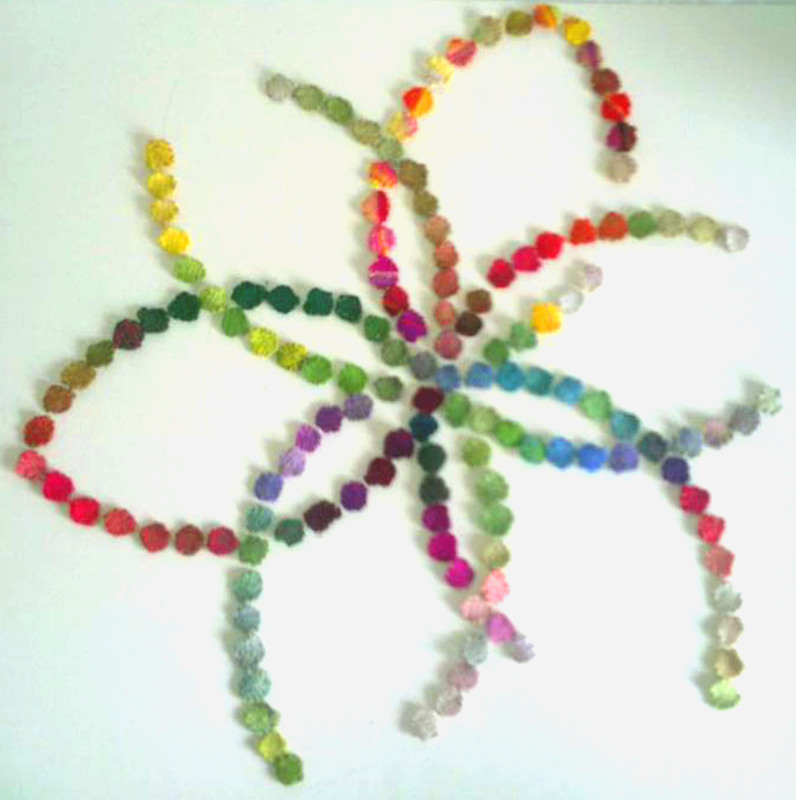 the shape comes from my teachings of the colour wheel to florists. It feels a good start to many ideas.I love working with colourways and my love of weave…it felt right to make each piece of either cotton or linen which of course is made from plants. This entry was posted in Blog and tagged fiber art, floristry, garden, scotland, tapestry, weave on 13/04/2010 by WebPerson. sorry for the lack of posts and pictures, I have been kinda overwhelmed with orders and working all spare hours in the new studio. I will try and get some pics up! I’m off to oban this friday to take some scarves to a shop who is intertested- and am possibly going to start asking other potential places too. Hopefull I’ll manage to get the rest of my things in the studio – loom is still wrapped up in the garden awaiting transport and so is the smaller wooden one inside and also my grandfathers stand which I use to sit on when weaving. 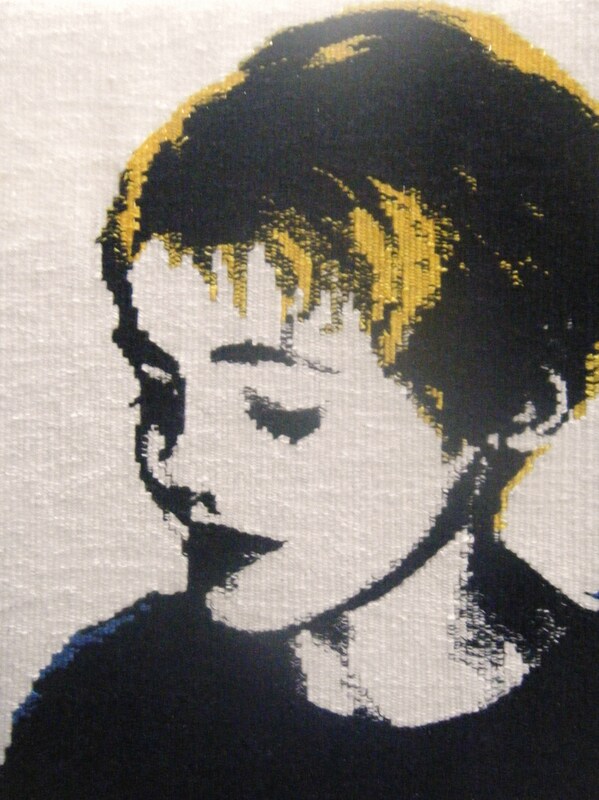 This entry was posted in Blog and tagged cashmere, oban, scarf, scarves, tapestry on 12/05/2009 by WebPerson. 2nd portrait of fiona nearly finished!!! Hurray nearly finished ,it always seems slow this bit but I’m nearly there! I really am pleased with it…its one of my most tricky portraits yet! 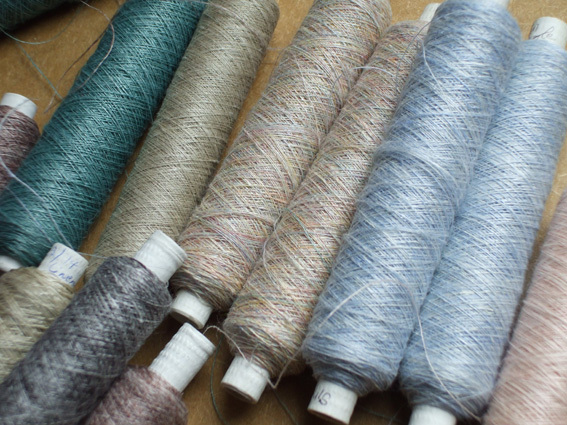 thought I’d also show you the threads bought from the handweavers gallery which is a specialist shop in london. These are singles hand dyed linens and are just to dye for literally! they are beautiful to work with and I love using them in my portraits. 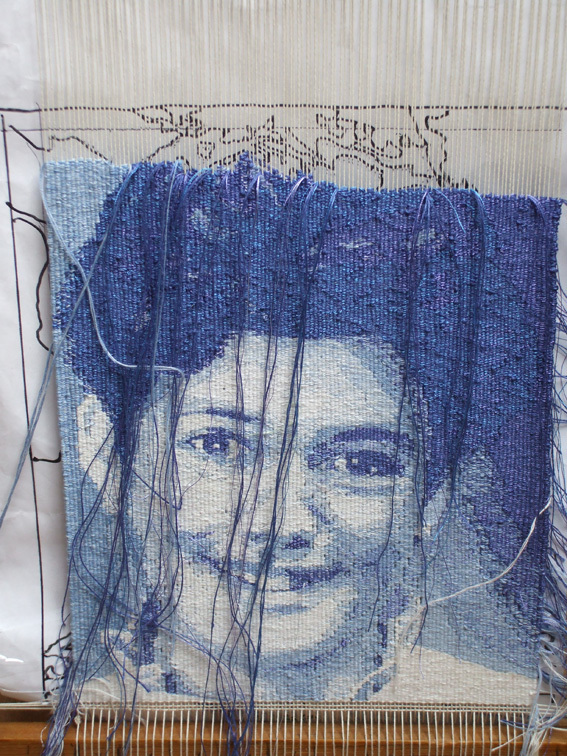 This entry was posted in Blog and tagged hanwoven, linen, portrait, tapestry on 19/07/2008 by WebPerson.